I wrote about my favorite experiences of 2012 last year, and it has been fun to go back and revisit some of them periodically. So…I thought I’d make another list for 2013 – the first full year of “She Ordered What?”. First, let me say that 2013 has been a fantastic year! I left a job that, to put it nicely, was un-fulfilling, moved to Milwaukee (a city that I am LOVING! ), am working for a supervisor I respect – and like, and have coworkers I enjoy (so much so that we opted to spend time together after the holiday party this year). I am living in downtown Milwaukee, and am thoroughly enjoying metropolitan living (as are my (now 13-year-old) dogs!). I am also traveling a bit more again, allowing for some interesting dining experiences. For me, change has been very good! So…I started compiling my top 5 choices of 2013, but the list quickly grew beyond five. I’ll list my “top 5” and a few honorable mentions – which provided great memories with a bunch of friends and colleagues. 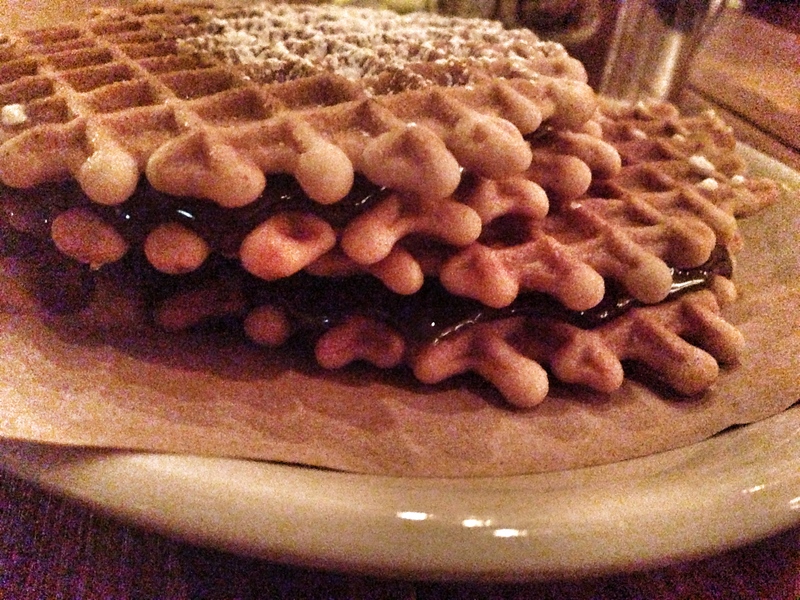 5) Melt Bar and Grilled: This is a bit of a cheat, as I actually posted this on December 28, 2012. However, I think Melt deserves a mention since the sandwich was so very good! 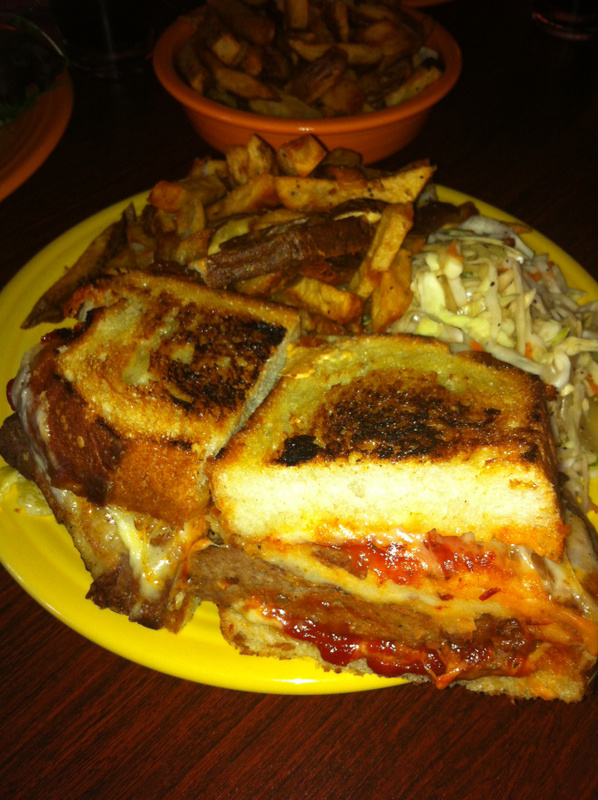 Full of carbs and comfort, the “Mom’s Meatloaf” grilled cheese was excellent, and very filling! I did end up having the second half of the sandwich for lunch the next day – and I ate it cold. It was really delicious as a cold leftover! 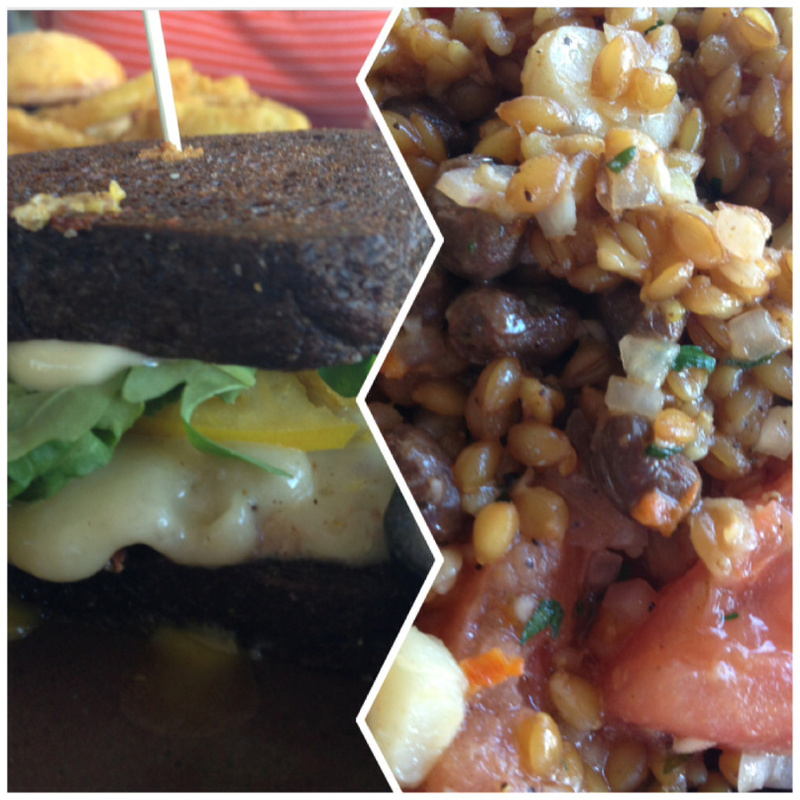 I’d also like to thank Melt Bar and Grilled for posting a link to my blog on their website. I really appreciate the additional traffic! 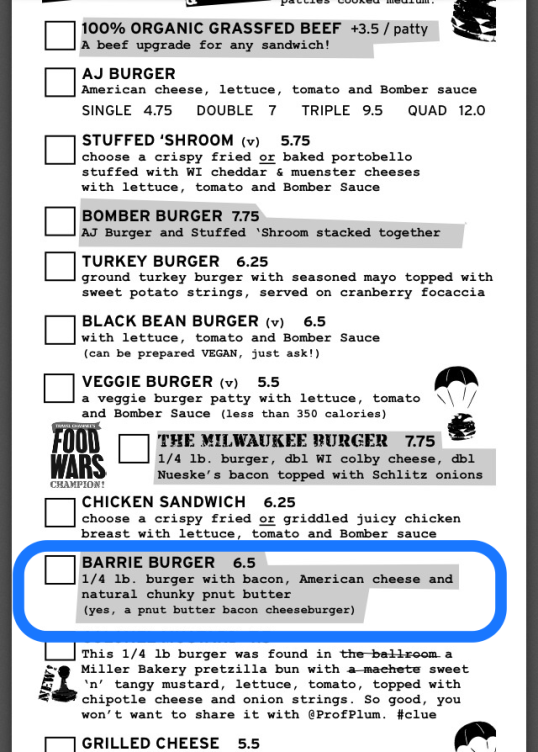 I’m looking forward to hitting up Melt when I make it back to Ohio next year. 3) Braise: I was introduced to Braise through a local food blogger, Phi, and I thoroughly enjoyed the whole dining experience with her and another food blogger, Shanon. The atmosphere is so cool. This used to be a bowling alley, and the owners repurposed a lot of the old elements to create a unique and inviting space. But, the food…is SO good! The menu is changed up regularly to incorporate the best ingredients, and it’s not an overwhelmingly large menu so one doesn’t have to feel pressure to sift through pages of options, hoping to make the right decision. I’ve been to Braise several times now, and in my opinion, any decision is a good one! Also, Braise just opened a second floor bar/lounge area. I’ll need to check that out! 2) Bacon Bros. Public House: Another locally sourced restaurant makes the list! I have Yelp! to thank for introducing my friends and me to this hidden gem. While visiting South Carolina to see my Clemson Tigers beat Boston College, we stumbled upon Bacon Bros. The food: the meat is locally sourced, and spectacular, and the side dishes have a definite southern flair to them, but with a new twist. The service was fantastic. And, their motto is “Powered by Bacon”! What’s not to love about this place? 1) The Publican: The fact that I drove ~90 miles each way to and from Chicago on a Tuesday night (in traffic and weather) could not even put a damper on this meal! Our server, whom I mentioned a few times in the post, was very good – and he was totally on board to surprise us that evening. The food was expertly prepared. 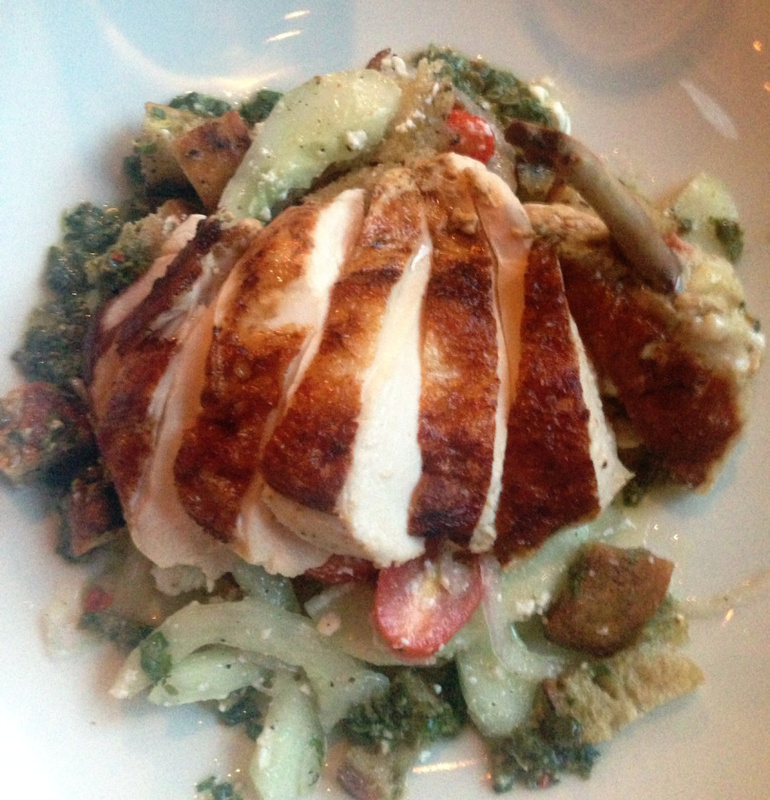 Again, The Publican is a restaurant that sources its ingredients locally – must love that! All in all, the atmosphere, the service, the food, and the company (Chanda!) were top-notch. I loved this place that is off the beaten path, so to speak, but may be home to the best meal I’ve had in Chicago (and I’ve had some REALLY good meals there!). I highly recommend The Publican if you’re looking for an excellent dining experience. 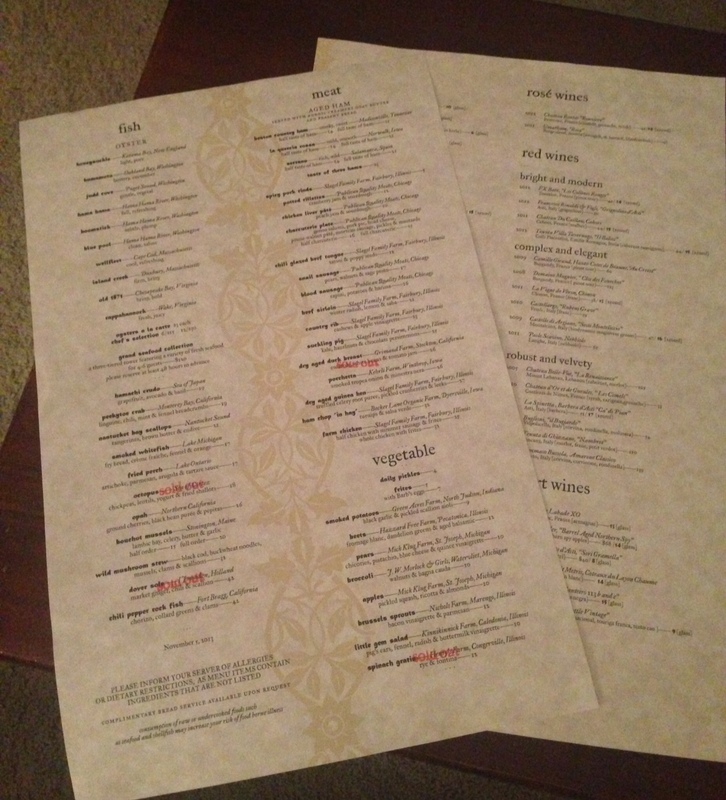 The menu changes up frequently here as well, but here is the selection from which we had to choose. I kicked the year off by celebrating a dear friend’s birthday in Detroit. I was able to meet some of her other wonderful friends, and we just had a fantastic time enjoying a city that tends to be “off-limits” after work or late at night. Detroit does indeed have some safe and fun spots to enjoy “after hours”. I also enjoyed celebrating my own birthday with friends – in Massachusetts. My friends gave me a perfectly balanced weekend. We had fun “out on the town”, enjoyed chilling at home, oh, and we ran a 10K in the middle of it all! I’m looking forward to seeing this crazy crew when we meet up for our other friends’ wedding in Memphis this February. Finally, categorize this under the “last, but not least” header… I had some fun times traveling with my new coworkers this year. We had some really fruitful business trips, but always seemed to sneak in a good meal or two! There was the “first meal in Nola”, the “marathon trip”, the “French food in Montreal”, the “mussels in Brussels”, and the “pork in Paris”. We’ve had other dining adventures, but not all warrant a “She Ordered What?” post. I will say this, I’m grateful for the way my colleagues have embraced me, and I find it refreshing to enjoy having a meal and/or a drink (or two!) with my coworkers. It certainly makes work more enjoyable! I wrote 22 posts to contribute to the overall number of 83 posts. The readers and I have posted 221 comments to the blog. There are over 1,800 “She Ordered What?” followers who viewed the blog almost 17,000 times. 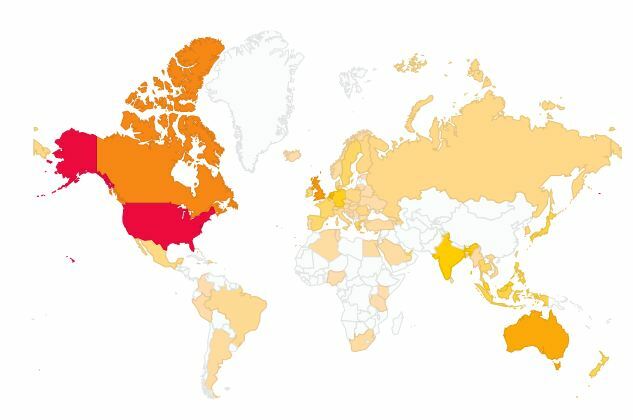 And, from all over the world…83 countries, actually (led by the US, Canada and Singapore)! Thank you again for your support and readership. As I mentioned last year, if you would like to write a guest post, please let me know. I enjoy sharing others’ experiences as well! Here’s to a happy, healthy, and fulfilling 2014! Chicago with Chanda! 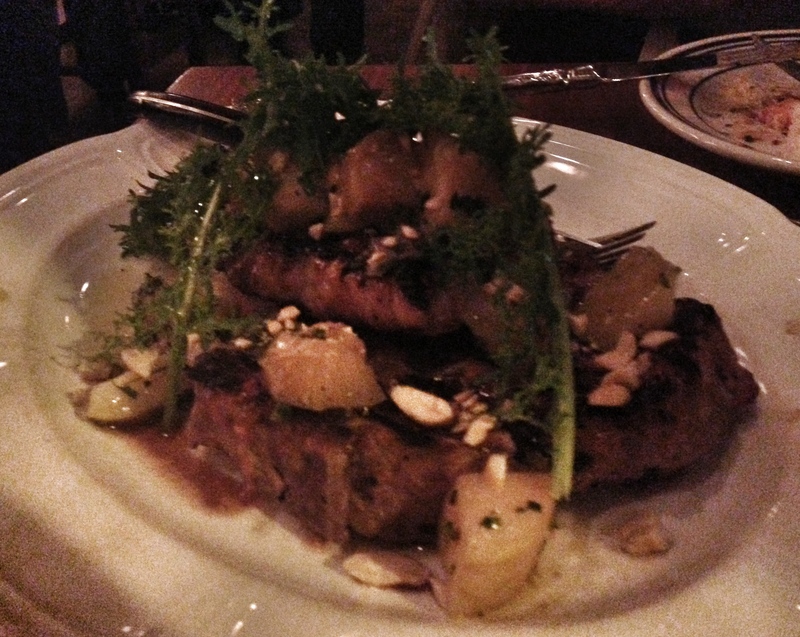 A divine dine at The Publican. A few weeks ago, I had the opportunity to see my dear friend, Chanda (pronounced like “panda”) while she was traveling from California to Chicago for business. Since Chicago is only ~90 miles from Milwaukee, we decided that we MUST meet up for dinner. I made the, errr, easy (if not for WI construction and Chicago traffic!) drive to meet her at her hotel. It took me about 2 hours and 20 minutes, but it was worth it to spend an evening with my friend. From the hotel, we “Uber“ed our way over the restaurant. Let me preface this by saying that we were not in the center of downtown Chicago – not Rush St, or even Michigan Ave. We were in a slightly more remote location – one which our driver even had a difficult time finding. I mean, it was still Chicago, but a little off the beaten path, so to speak. So it was a bit disconcerting as our driver took us through some alley ways and nearly got in an accident. Chanda and I exchanged more than one “what the heck is going on?! ?” look! When we eventually reached The Publican, we entered a huge and beautiful restaurant. Lantern lights hung from the ceiling, and large, interesting prints of pigs hung on the walls. In the center there were looong tables. The edges showcased very private booths (with doors to close off your table!). Chanda and I were seated at a table near the front of the restaurant – overlooking the now-closed outdoor patio and the street. We were warmly greeted by our server, Nick, who was a total cross between George Clooney in his “The Facts of Life” days, and Adrian Grenier. Nick also liked to get right down in our faces to explain the menu, the concept and how the evening would go. I won’t lie, there was something mesmerizing about him! Nick advised us that the menu changes frequently, and is organized from smallest dishes to larger plates (within each category). He advised us to share 3-4 dishes, and to order all at once so he could work the proper timing out with the kitchen. Chanda was really interested in having the octopus, and I was totally game for that! We also decided to try the charcuterie plate. I asked her if she had any concerns with me turning my “contributions” over to Nick, and she didn’t. Well…she wasn’t exactly keen at the thought of being served blood sausage, but we were willing to take that risk! When I asked Nick to choose two dishes to compliment the octopus, and surprise us, he was all in! With a confident nod of his head and a big grin, he walked away to place our order. Meanwhile…the place got PACKED! This was a Tuesday evening, and the restaurant is not small, so we strongly suspected that Chanda had chosen wisely! 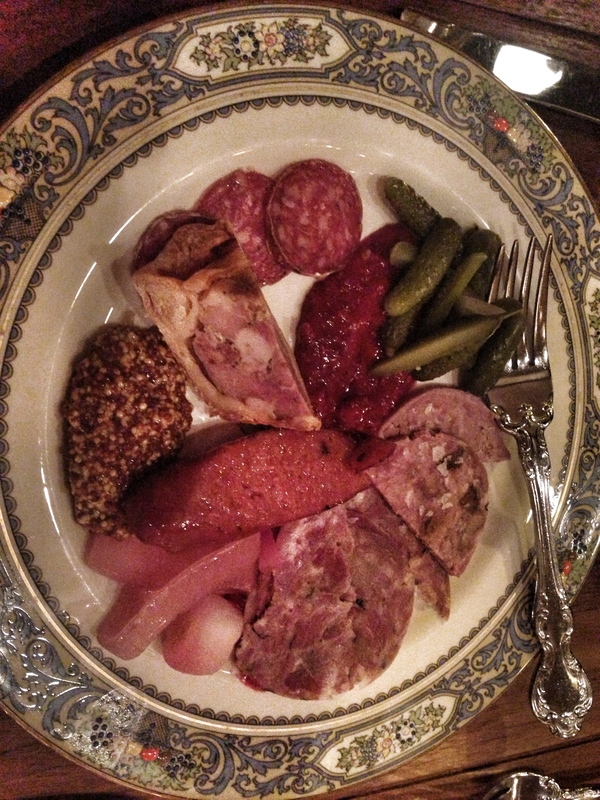 We thoroughly enjoyed everything on the (half) charcuterie plate… genoa salumi, pork pie, head cheese, prune-walnut pâté, morteau sausage, pickles, and mustards. The fresh bread that was served alongside the first dish was delicious too! Note: I apologize for the poor photo quality. I should have adjusted my settings during dinner, but failed to do so. These photos will not do the dishes justice. Next, we received the octopus and an apple salad (as chosen by Nick – though I admit that the dish had actually caught my eye on the menu). 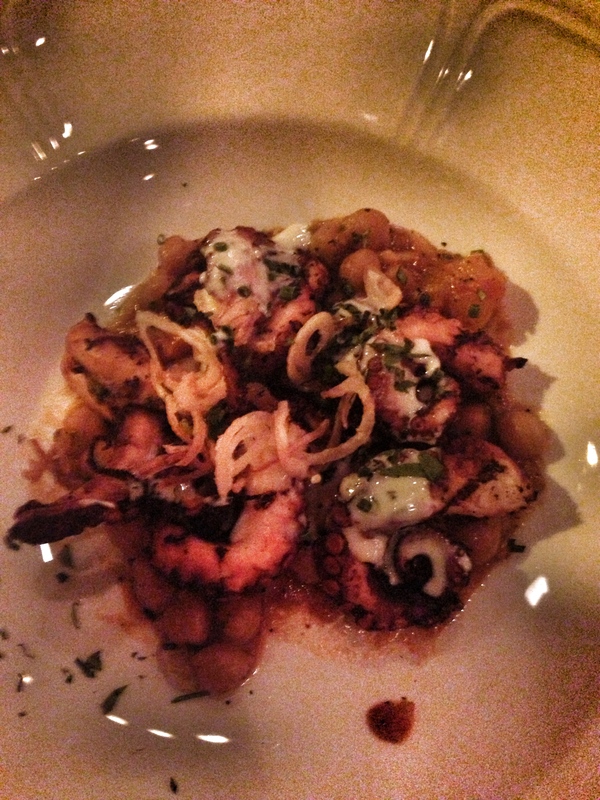 The octopus (from the Sea of Cortez) was grilled to perfection, and served with chickpeas, yogurt, lentils and fried shallots. Amazing flavor! 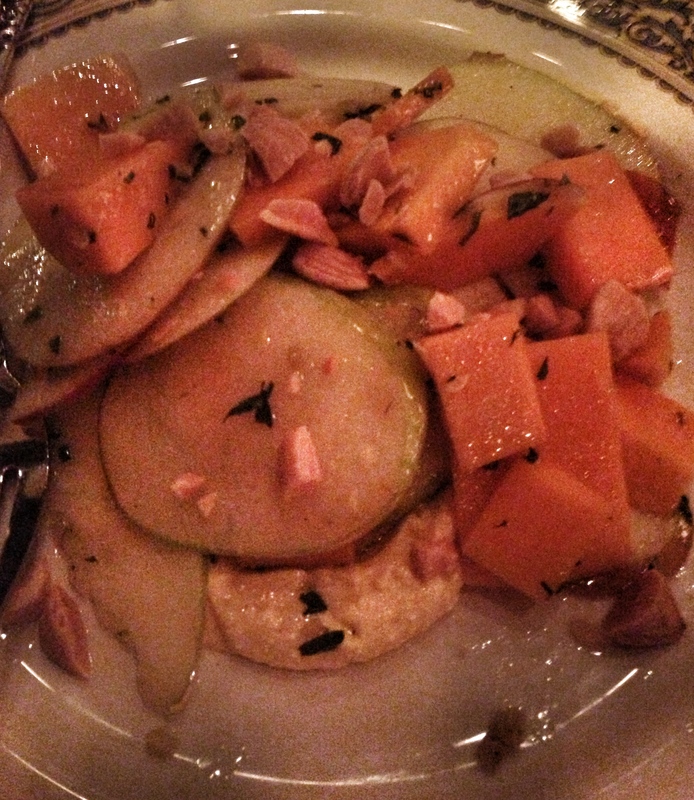 The Mick Klug Farm (St. Joseph, MI) salad consisted of apples, pickled squash served over a ricotta cheese “sauce” of sorts and topped off with almonds. It had wonderful fall flavors – a very fresh taste! And, it was nice to have a light “vegetable” dish. Following the octopus and apple dishes, Chanda and I were served the country rib. This is from the Slagel Familly Farm in Fairbury, IL, and dear goodness… Just when we thought the dinner couldn’t be more delicious – it was! The ribs are simply prepared, with cashews and apple vinaigrette, but the dish packed amazing flavor. 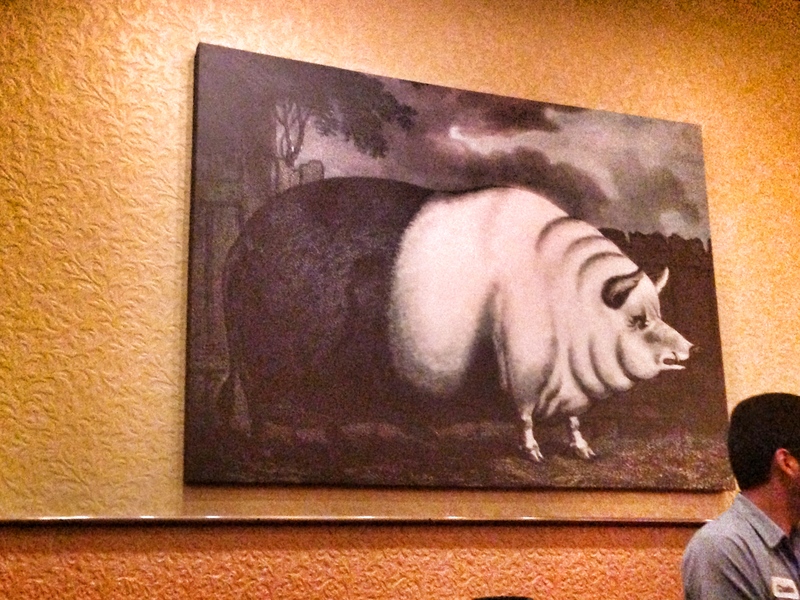 Chanda and I thoroughly enjoyed our meal, and while we were comfortably full, we weren’t overly stuffed. We just felt as though we completely enjoyed each other’s company as well as a phenomenal dining experience. Chanda even convinced me to have a bite of dessert (I can’t recall the actual description, but it was basically homemade pizelles with caramel chocolate sauce between them, and topped off with powdered sugar). How could we go wrong? I hated to have to end the evening so quickly, but I did have 90 miles to drive back home – on a “school night”. 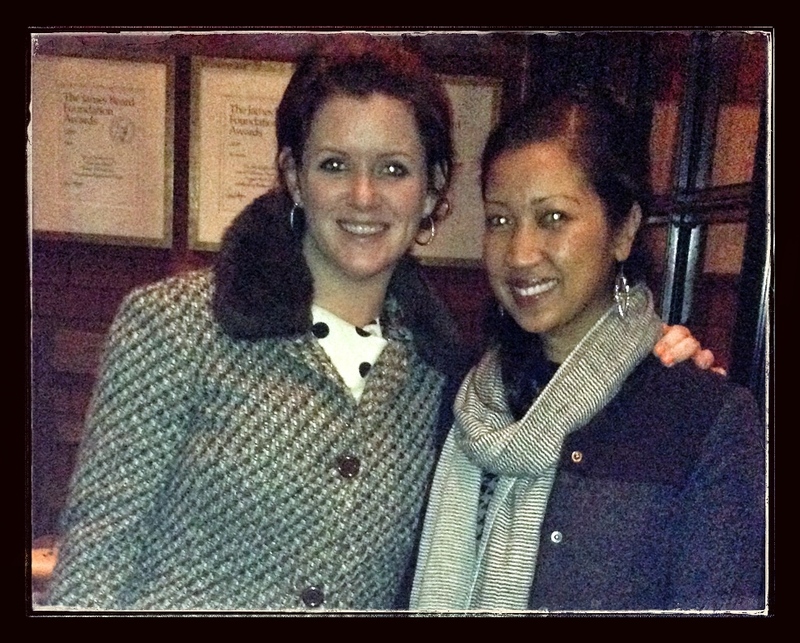 I do HIGHLY recommend a trip over to The Publican if you’re in Chicago and are looking for a great meal. And, if you’re fortunate enough to have Nick as your server, feel confident that he knows his stuff and will make great recommendations! Also, as previously noted, the menu changes frequently, so be prepared to be flexible. The kind staff at The Publican allowed me to take both the dinner and the drink menus (since they’re printed frequently) with me. 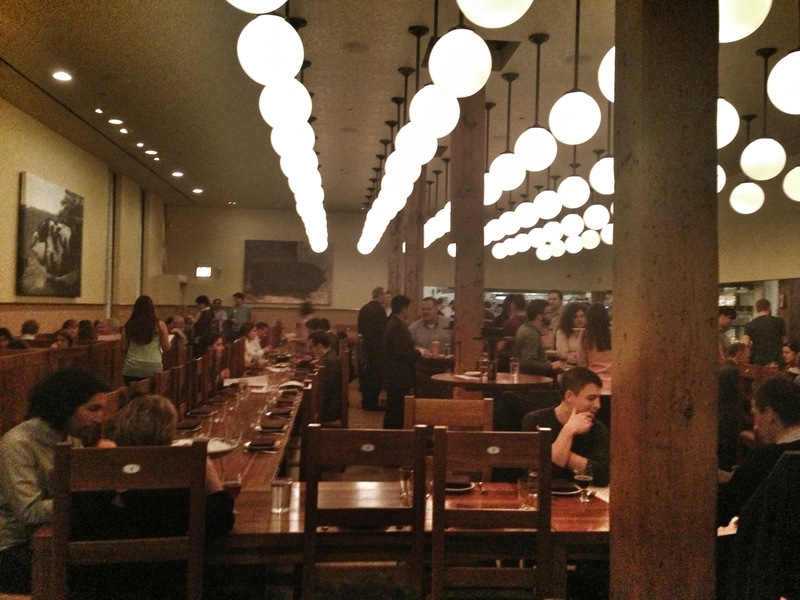 If you’ve been to The Publican, I’d love hear about the dishes you tried. Please share you experience!